Re-reading the Fantastic Four comics from the start. Issue #44 is interesting, in that a typically C-list character gets his one and only shot on the A-list. 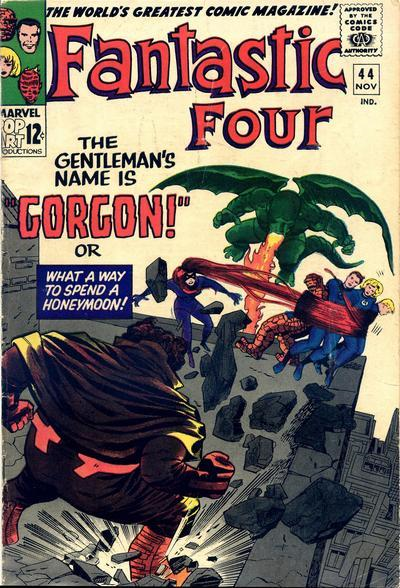 The issue begins with numerous references to Reed and Sue’s recent wedding (I’m assuming the annual was on sale at the same time as this ish). Domestic bliss in the FF means Reed invents an elaborate “full-automated dish-washer mechanism” to help around the kitchen. 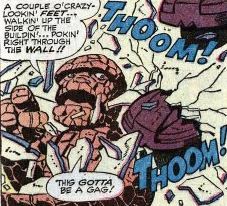 This leads to wisecracks from Ben and Johnny, and some fighting among them, for this issue’s excuse-for-the-characters-to-show-off-their-powers-for-a-few-pages thing. At the Baxter Building, the entire structure is rocked by a series of shock waves. Someone incredibly strong is climbing up the side of the building. Reed, Sue and Ben recover, but not in time enough to find the culprit, who escapes in a helicopter. Cut from there to the woods, where Medusa has taken Johnny, as Johnny notes that it’s near the spot where the FF visited State U. a while back. Medusa proclaims she doesn’t need the FF’s help, and knocks Johnny out with a vacuum pellet. The ground erupts under her, and out comes Dragon Man, from where we was last seen in issue #35. (Yes, it’s a total coincidence that he shows up, nothing more.) Dragon Man attacks, but at the last minute, he stops, because Medusa reminds him of Sue. The helicopter from earlier lands nearby, and out steps Gorgon. We’re not told much about who he is, except that he’s a huge guy with what might be hooves for feet. 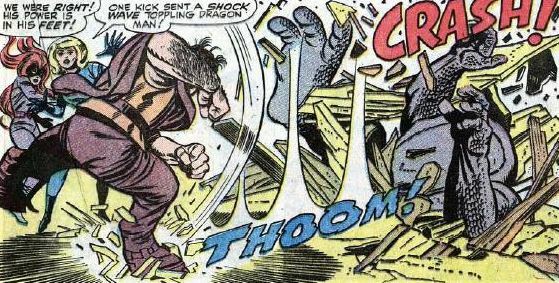 Said feet can kick and stomp with amazing power, destroying boulders and creating massive shock waves. He’s still after Medusa, but the now-smitten Dragon Man defends her, and there are a couple of pages of Dragon Man and Gorgon fighting it out. Dragon Man flies off with Medusa, and Gorgon pursues in the helicopter. Johnny wakes up, and goes after them. Reed, whose arm was injured in the shock waves, goes off in search of the attacker, with Ben and Sue right behind him. They encounter Medusa and Dragon Man on a nearby rooftop, and more fighting breaks out, with Ben bringing the pain to Dragon Man. 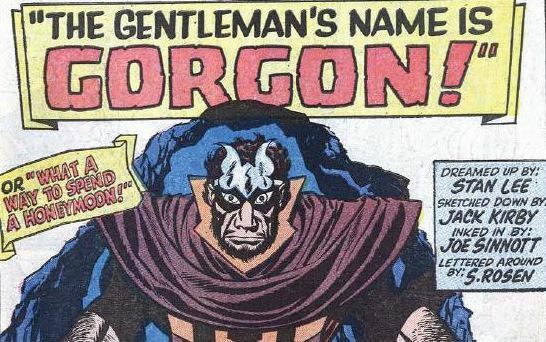 Gorgon shows up, and demonstrates his raw power, leveling most of the rooftop with a single stomp, and sending Dragon Man down into the building. Gorgon ominously states that he’s there to take Medusa back to where she belongs, and that Medusa is forbidden to mingle with outsiders. 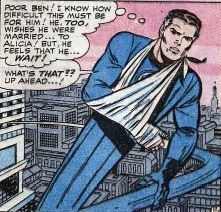 Unstable molecule: The sight of the bendy-stretchy Reed with his arm in a cast and sling should be shocking, but it only lasts for a few panels, and then his injury isn’t mentioned again. Fade out: Sue once again tames the savage beast (sort of), as Dragon Man only has eyes for her. Flame on: Johnny’s car in this issue is a 1965 Chevrolet Stingray Coupe. Trivia time: In old-timey Greek mythology, a Gorgon was a monstrous woman with snakes for hair. Medusa and her two sisters were, in fact, Gorgons. As we’ll see in the next few issues, the Marvel Medusa and Gorgon are not the ones from the myths. Next issue: The (not-so-dark) Crystal.